Do you need help getting into the holiday season this year? 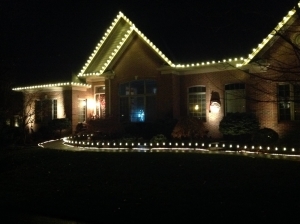 We are turn key service for all your holiday light needs. Our sales rep will discuss your lighting choices and explain how the process works. After that they will ask you about the areas you want decorated, offer suggestions and create an estimate for you. Get on Online quote now. We will bring the lights and decorations which we use all LEDs lights. Installation usually takes two to three hours to have your home looking amazing. All lights will be custom fit to your home. If you have a light issue or problems we come out within 48 hours and fix any problems. We want your home to look the best in the neighborhood. The best part about it is that in January when its cold outside you dont have to take them down. We will remove all lights the first three weeks of January.